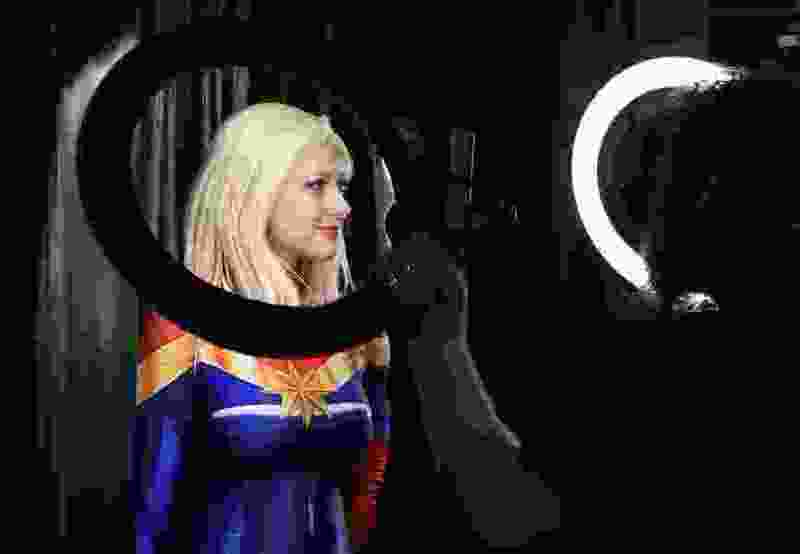 (Francisco Kjolseth | The Salt Lake Tribune) Kaylynn Wolfe of Layton as Captain Marvel poses for a photo for the start of last fall's FanX Salt Lake Comic Convention at the Salt Palace in Salt Lake City. 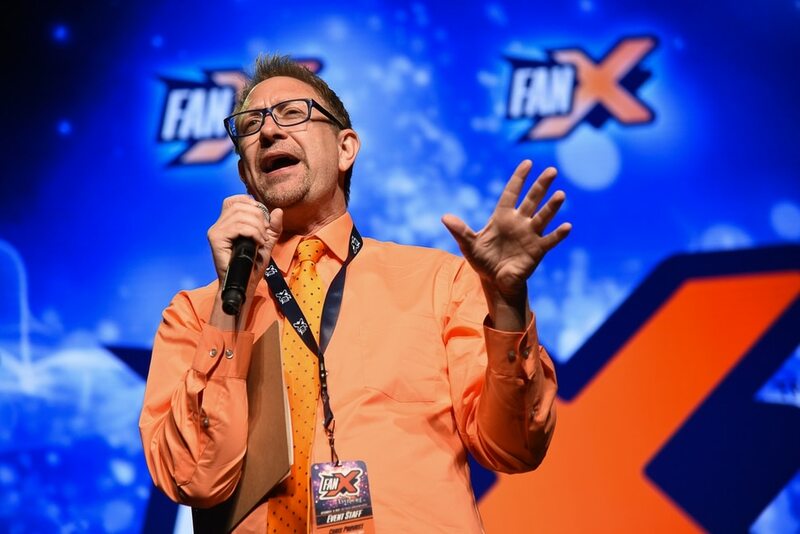 The spring edition of FanX runs Friday and Saturday, April 19-20, 2019. D’Errico is a painter and comic-book artist and writer who is part of a growing movement to expand “fan culture” — that space for superheroes, space aliens, vampires and other fantastical beings found in comic books and genre TV and movies — past the stereotype as a clubhouse for nerdy boys and men. 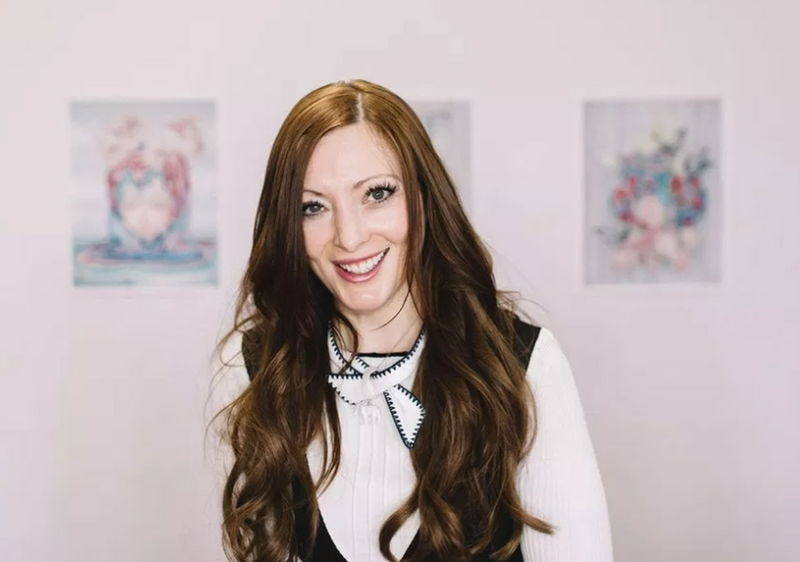 (Photo courtesy of the artist) Canadian artist Camilla D'Errico, whose works include the comic book series Tanpopo and the HelmetGirls drawings, is one of the creators who will attend FanX Salt Lake Comic Convention in the Salt Palace, April 19-20, 2019. (Photo courtesy of the author) Utah author M.K. 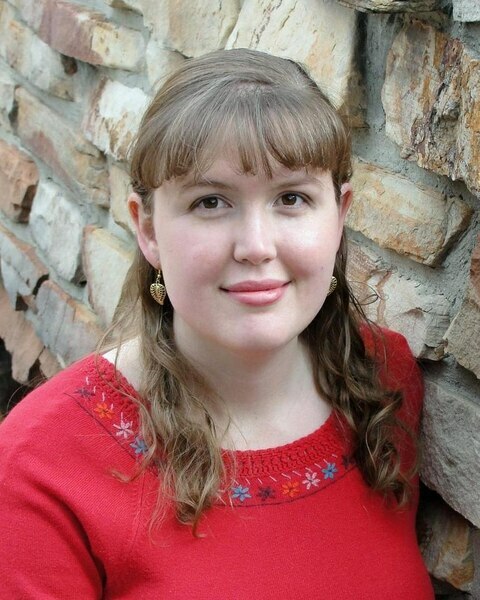 Hutchins, whose works include the fantasy novel Drift, is one of the creators who will attend FanX Salt Lake Comic Convention in the Salt Palace, April 19-20, 2019. 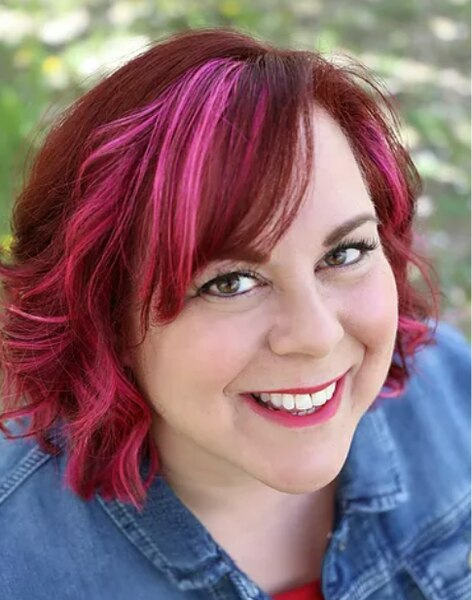 (Photo courtesy of the author) Utah author Ali Cross, whose works include the Desolation book series and the Minnie Kim: Vampire Girl books, is one of the creators who will attend FanX Salt Lake Comic Convention in the Salt Palace, April 19-20, 2019. (Photo courtesy of the author) Utah author Charlie N. Holmberg, whose novels include Smoke & Summons and The Paper Magician, is one of the creators who will attend FanX Salt Lake Comic Convention in the Salt Palace, April 19-20, 2019. And conventions, like the spring FanX Salt Lake Comic Convention that runs Friday and Saturday at the Salt Palace Convention Center, are where some of that expansion is happening. Still, those perceptions of fandom as a men-only bastion die hard. Hutchins, who wrote the fantasy novel “Drift,” is a fan of board games and tabletop role-playing games — and she’s endured sexist commentary from men. “I knew people who would say, ‘She only plays because her boyfriend plays,’” Hutchins said, adding that when she attended Brigham Young University, women-only game nights with her roommates and neighbors were common. 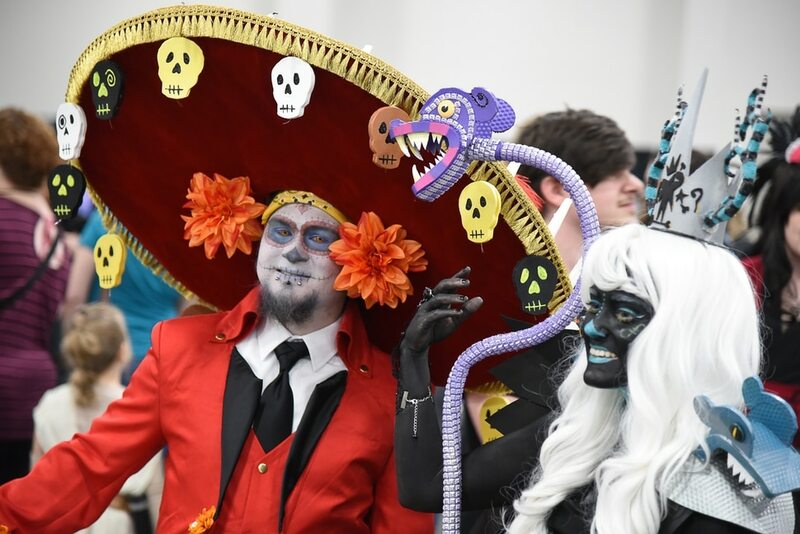 (Francisco Kjolseth | The Salt Lake Tribune) Eric and Trysten Molina of Orem as characters from The Book of Life attend the start of FanX Salt Lake Comic Convention at the Salt Palace in Salt Lake City Thursday, Sept. 6, 2018, during the three-day pop culture convention. (Francisco Kjolseth | The Salt Lake Tribune) Scott and Valerie Guyant along with their son Gryphon dress as characters from the movie Deadpool as they attend the start of FanX Salt Lake Comic Convention at the Salt Palace in Salt Lake City Thursday, Sept. 6, 2018, during the three-day pop culture convention. (Francisco Kjolseth | The Salt Lake Tribune) Chris Provost emcee's during the start of FanX Salt Lake Comic Convention at the Salt Palace in Salt Lake City Thursday, Sept. 6, 2018, during the three-day pop culture convention. (Francisco Kjolseth | The Salt Lake Tribune) Megan McFarland of Kaysville has her picture taken with Slimer from Ghost Busters as she attends the start of FanX Salt Lake Comic Convention at the Salt Palace in Salt Lake City Thursday, Sept. 6, 2018, during the three-day pop culture convention. (Francisco Kjolseth | The Salt Lake Tribune) Kaylynn Wolfe of Layton as Captain Marvel poses for a photo for the start of FanX Salt Lake Comic Convention at the Salt Palace in Salt Lake City Thursday, Sept. 6, 2018, during the three-day pop culture convention. (Francisco Kjolseth | The Salt Lake Tribune) Chelsea Grimes as princess Aurora poses for a photograph with Jason White as Dalek from Dr. Who as they attend the start of FanX Salt Lake Comic Convention at the Salt Palace in Salt Lake City Thursday, Sept. 6, 2018, during the three-day pop culture convention. (Francisco Kjolseth | The Salt Lake Tribune) Hyrum Miller, left, poses for a photograph with The Greatest American Hero played by Vincent Robinette, as they attend the start of FanX Salt Lake Comic Convention at the Salt Palace in Salt Lake City Thursday, Sept. 6, 2018, during the three-day pop culture convention. (Francisco Kjolseth | The Salt Lake Tribune) Eric Hall of Midvale dresses up as Red Skull from Captain America as he attends the start of FanX Salt Lake Comic Convention at the Salt Palace in Salt Lake City Thursday, Sept. 6, 2018, during the three-day pop culture convention. (Francisco Kjolseth | The Salt Lake Tribune) Chris Provost emcee's during the start of FanX Salt Lake Comic Convention at the Salt Palace in Salt Lake City Thursday, Sept. 6, 2018, during the three-day pop culture convention. (Francisco Kjolseth | The Salt Lake Tribune) Tyler Smith of Twin Falls, ID, as Reaper from Overwatch attends the start of FanX Salt Lake Comic Convention at the Salt Palace in Salt Lake City Thursday, Sept. 6, 2018, during the three-day pop culture convention. (Francisco Kjolseth | The Salt Lake Tribune) Chuck Workman performs his services for free as he wanders among those attending the start of FanX Salt Lake Comic Convention at the Salt Palace in Salt Lake City Thursday, Sept. 6, 2018, during the three-day pop culture convention. (Francisco Kjolseth | The Salt Lake Tribune) Vincent Robinette of Pleasant View as the Greatest American Hero attends the start of FanX Salt Lake Comic Convention at the Salt Palace in Salt Lake City Thursday, Sept. 6, 2018, during the three-day pop culture convention. (Francisco Kjolseth | The Salt Lake Tribune) T.J. DeCarlo, a police officer from North Salt Lake shows off his Tony Stark costume as he attends the start of FanX Salt Lake Comic Convention at the Salt Palace in Salt Lake City Thursday, Sept. 6, 2018, during the three-day pop culture convention. (Francisco Kjolseth | The Salt Lake Tribune) Lacey Loop of Cedar Hills shows off her steam punk Aerial costume as she attend the start of FanX Salt Lake Comic Convention at the Salt Palace in Salt Lake City Thursday, Sept. 6, 2018, during the three-day pop culture convention. (Francisco Kjolseth | The Salt Lake Tribune) All sorts of people in costumes attend the start of FanX Salt Lake Comic Convention at the Salt Palace in Salt Lake City Thursday, Sept. 6, 2018, during the three-day pop culture convention. 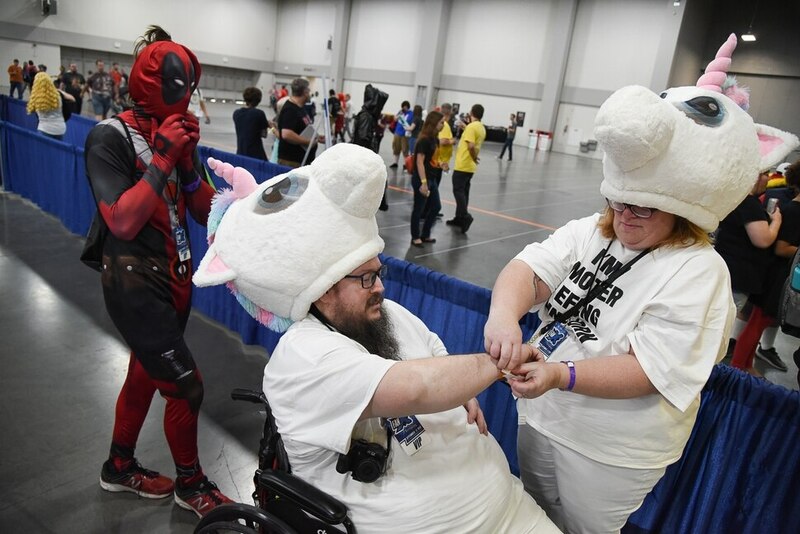 (Francisco Kjolseth | The Salt Lake Tribune) Seamus Redmond of Reno, NV, as Deadpool attends the start of FanX Salt Lake Comic Convention at the Salt Palace in Salt Lake City Thursday, Sept. 6, 2018, during the three-day pop culture convention. (Francisco Kjolseth | The Salt Lake Tribune) Ahi Transfield as Pyramid Head and Brooke Tabbutt as nurse attend the start of FanX Salt Lake Comic Convention at the Salt Palace in Salt Lake City Thursday, Sept. 6, 2018, during the three-day pop culture convention. (Francisco Kjolseth | The Salt Lake Tribune) Crews get ready for those attending the start of FanX Salt Lake Comic Convention at the Salt Palace in Salt Lake City Thursday, Sept. 6, 2018, during the three-day pop culture convention. (Francisco Kjolseth | The Salt Lake Tribune) Chuck Workman offers his services for free as he attends the start of FanX Salt Lake Comic Convention at the Salt Palace in Salt Lake City Thursday, Sept. 6, 2018, during the three-day pop culture convention. (Francisco Kjolseth | The Salt Lake Tribune) Brock Durffee of Mona, UT, as Absol attends the start of FanX Salt Lake Comic Convention at the Salt Palace in Salt Lake City Thursday, Sept. 6, 2018, during the three-day pop culture convention. (Francisco Kjolseth | The Salt Lake Tribune) Alice who only goes by one name as Harley Quinn attends the start of FanX Salt Lake Comic Convention at the Salt Palace in Salt Lake City Thursday, Sept. 6, 2018, during the three-day pop culture convention. (Francisco Kjolseth | The Salt Lake Tribune) Grant Kakazu as Riven attends the start of FanX Salt Lake Comic Convention at the Salt Palace in Salt Lake City Thursday, Sept. 6, 2018, during the three-day pop culture convention. (Francisco Kjolseth | The Salt Lake Tribune) Fans wait in line to attend the start of FanX Salt Lake Comic Convention at the Salt Palace in Salt Lake City Thursday, Sept. 6, 2018, during the three-day pop culture convention. (Francisco Kjolseth | The Salt Lake Tribune) Chris Provost emcee's during the start of FanX Salt Lake Comic Convention at the Salt Palace in Salt Lake City Thursday, Sept. 6, 2018, during the three-day pop culture convention. (Francisco Kjolseth | The Salt Lake Tribune) Eponine Winston, 4, and her parents Kathryn and Levi of Tacoma, Wash., as characters from the Pixar short The Paper Man attend the start of FanX Salt Lake Comic Convention at the Salt Palace in Salt Lake City Thursday, Sept. 6, 2018, during the three-day pop culture convention. (Francisco Kjolseth | The Salt Lake Tribune) Randall Henry of Tremonton as Dormammu attends the start of FanX Salt Lake Comic Convention at the Salt Palace in Salt Lake City Thursday, Sept. 6, 2018, during the three-day pop culture convention. (Francisco Kjolseth | The Salt Lake Tribune) Oliver DeMill of Lehi as Auron of Final Fantasy 10 attends the start of FanX Salt Lake Comic Convention at the Salt Palace in Salt Lake City Thursday, Sept. 6, 2018, during the three-day pop culture convention. (Francisco Kjolseth | The Salt Lake Tribune) Debbie Lance assembles a Belle dress from Beauty and the Beast made out of balloons as part of Locally Twisted as she attends the start of FanX Salt Lake Comic Convention at the Salt Palace in Salt Lake City Thursday, Sept. 6, 2018, during the three-day pop culture convention. (Francisco Kjolseth | The Salt Lake Tribune) Kaylynn Wolfe of Layton as Captain Marvel poses for a photo with attendees to the start of FanX Salt Lake Comic Convention at the Salt Palace in Salt Lake City Thursday, Sept. 6, 2018, during the three-day pop culture convention. (Francisco Kjolseth | The Salt Lake Tribune) Vaughn and Sarah Bechtol of Portland, Ore., as Judge Dredd characters attend the start of FanX Salt Lake Comic Convention at the Salt Palace in Salt Lake City Thursday, Sept. 6, 2018, during the three-day pop culture convention. (Francisco Kjolseth | The Salt Lake Tribune) Nicholas Meyeres of Kanab as Mr. Rogers attends the start of FanX Salt Lake Comic Convention at the Salt Palace in Salt Lake City Thursday, Sept. 6, 2018, during the three-day pop culture convention. (Francisco Kjolseth | The Salt Lake Tribune) Abigail Willis of Provo, UT, as Harley Quinn attends the start of FanX Salt Lake Comic Convention at the Salt Palace in Salt Lake City Thursday, Sept. 6, 2018, during the three-day pop culture convention. (Francisco Kjolseth | The Salt Lake Tribune) Kyle Anderson, left, goofs off with a Infinity Gauntlet alongside T.J. DeCarlo as Tony Stark as they attend the start of FanX Salt Lake Comic Convention at the Salt Palace in Salt Lake City Thursday, Sept. 6, 2018, during the three-day pop culture convention. (Francisco Kjolseth | The Salt Lake Tribune) Products for sale are slowly put into place for the start of FanX Salt Lake Comic Convention at the Salt Palace in Salt Lake City Thursday, Sept. 6, 2018, during the three-day pop culture convention. (Francisco Kjolseth | The Salt Lake Tribune) Creatures are on display for the start of FanX Salt Lake Comic Convention at the Salt Palace in Salt Lake City Thursday, Sept. 6, 2018, during the three-day pop culture convention. (Francisco Kjolseth | The Salt Lake Tribune) Rachel Kingsford, left, and Justine Ghosty as characters from Overwatch attend the start of FanX Salt Lake Comic Convention at the Salt Palace in Salt Lake City Thursday, Sept. 6, 2018, during the three-day pop culture convention. (Francisco Kjolseth | The Salt Lake Tribune) Billie Glorfield as Hela from Thor attends the start of FanX Salt Lake Comic Convention at the Salt Palace in Salt Lake City Thursday, Sept. 6, 2018, during the three-day pop culture convention. (Francisco Kjolseth | The Salt Lake Tribune) Julio Marinez as Ruby Rhod attends the start of FanX Salt Lake Comic Convention at the Salt Palace in Salt Lake City Thursday, Sept. 6, 2018, during the three-day pop culture convention. (Francisco Kjolseth | The Salt Lake Tribune) T.J. DeCarlo, a police officer with North Salt Lake dresses as Tony Stark as he poses for a photo with Owen Edwards, 7, left, and his brother Quinn, 8, as they attend the start of FanX Salt Lake Comic Convention at the Salt Palace in Salt Lake City Thursday, Sept. 6, 2018, during the three-day pop culture convention. (Francisco Kjolseth | The Salt Lake Tribune) Emily Howell of Salt Lake as the Corpse Bride attends the start of FanX Salt Lake Comic Convention at the Salt Palace in Salt Lake City Thursday, Sept. 6, 2018, during the three-day pop culture convention. (Francisco Kjolseth | The Salt Lake Tribune) Artist Jerry Pesce shows off his work as he attends the start of FanX Salt Lake Comic Convention at the Salt Palace in Salt Lake City Thursday, Sept. 6, 2018, during the three-day pop culture convention. (Francisco Kjolseth | The Salt Lake Tribune) Lindsey Lopez of Cedar Hills as Syaoran of Card Captor Sakura attends the start of FanX Salt Lake Comic Convention at the Salt Palace in Salt Lake City Thursday, Sept. 6, 2018, during the three-day pop culture convention. (Francisco Kjolseth | The Salt Lake Tribune) Aidan Clinard, 14, as Molten Freddy attends the start of FanX Salt Lake Comic Convention at the Salt Palace in Salt Lake City Thursday, Sept. 6, 2018, during the three-day pop culture convention. (Francisco Kjolseth | The Salt Lake Tribune) Lindsey Spiker and Bobby Prieto attend the start of FanX Salt Lake Comic Convention at the Salt Palace in Salt Lake City Thursday, Sept. 6, 2018, during the three-day pop culture convention. (Francisco Kjolseth | The Salt Lake Tribune) People attend the start of FanX Salt Lake Comic Convention at the Salt Palace in Salt Lake City Thursday, Sept. 6, 2018, during the three-day pop culture convention. Which is not to say full equality has been achieved. Of this spring’s 34 celebrity guests listed on the event’s website, nine of them — or 26.5% — are women, the most recognizable being Lynda Carter, TV’s Wonder Woman. Women represent 11.8% of the artists and comics creators booked for FanX, 28.1% of the authors and 37.3% of the listed panelists. D’Errico praises the move toward equality between women and men in fandom, and in the art sold at conventions. But that’s only the first step. “What I’d like to see more of is cultural diversity in art,” D’Errico said. One area where gender equity is most pronounced, Cross said, is in cosplay. Crossplay, where women dress as male characters and vice versa, and gender-bends — where, for example, a woman will create a female version of a male character — are becoming more popular. “The men tend to dress in evocative female costumes — I’ve seen men freer to express themselves,” Cross said. That expression, Cross said, is the core of what makes conventions popular. “It’s the only place where being wildly different is celebrated,” she said. The spring 2019 edition of FanX Salt Lake Comic Convention, a two-day convention celebrating movies, TV, comic books, games and other nerdy pursuits. Where • Salt Palace Convention Center. When • Friday and Saturday, April 19-20. Tickets • Individual tickets and two-day passes available at fanxsaltlake.com.